The below products meet all applicable ANSI standards and OSHA regulations. All Lynx products are completely interchangeable with all Ropods™, Davits, Dynevacs, Dyna-Hoists™, and Ropod/Davit Mounting Brackets. The Lynx Rescuer is intended to provide fall arrest and emergency rescue when entering/exiting a confined space. The Lynx tripod can be set up and dismantled without the use of tools. It has a vertical load strength of 5,400 pounds. The Lynx Hoist is intended to be used in confined space application that require lifting/lowering of materials or personnel. 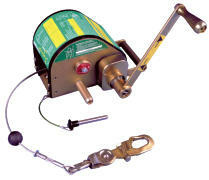 Complete confined space entry kits for multiple confined space applications. 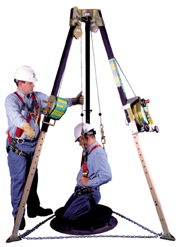 Used for lifting and lowering materials and personnel via the hoist, while having the ability to use an SRL in conjunction with the rest of the system for fall arrest and emergency evacuation.